The first LVT with pre-applied adhesive. When you receive QuickStix LVT from Mannington, it is ready to be installed, sticks and sets immediately, and lets you go back and forth on the floor without any wait time. QuickStix water-based adhesive technology does away with the need for adhesive pails, trowels, and hours of labor. Simply prime, peel, position, and roll. 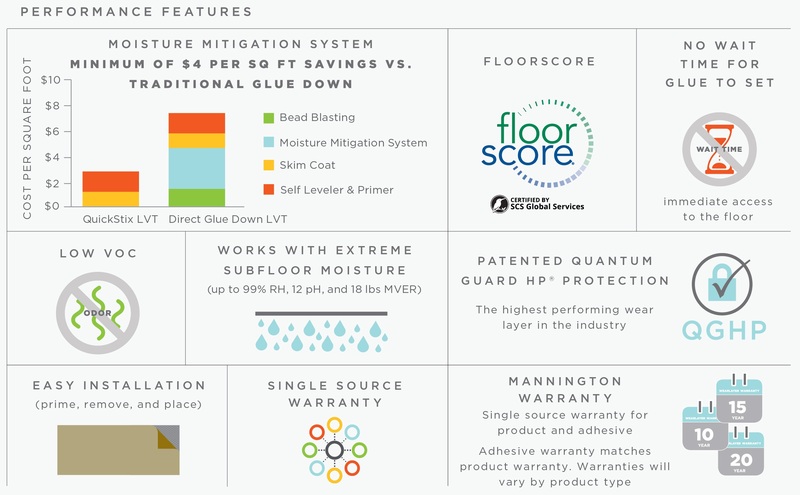 QuickStix also has incredible moisture resistance properties, making it ideal for renovation applications in healthcare, education, retail, and other segments where downtime has significant cost implications. QuickStix is available on most Mannington Commercial, Amtico, and Spacia LVT products. Ready. Stick. Go.